1. In 2013 there is a year over year decline of approximately 50% in new distress situations. 2. 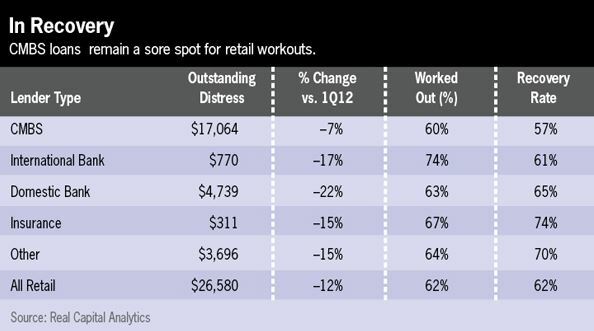 The total volume of distressed retail mortgages totaled $26.8Billion in Q1 2013. 7. In the past 12 months, CMBS lenders had the smallest decline in the total volume of distressed loans of any lender type (7%), the lowest workout level of any lender type (60%), and the lowest recovery rate (57%). The numbers speak not only to the retail sector, but to the inordinate amount of retail financing provided by CMBS. In addition, due to the increasing competition of e-commerce, many lower tier locations are more vulnerable to the loss of anchor tenants, and subsequent severe distress. Retailer’s continued efforts to right-size their portfolios are leading to undesirable side effects for legacy retail mortgages. Research firms that focus on the credit markets report that even as the overall volume of distressed retail loans has been shrinking, loss severities have been growing. At fault is the drop in the number of available retail tenants, says David Putro, vice president and team leader with the CMBS surveillance group at Morningstar Credit Ratings LLC. As retailers shrink their bricks-and-mortar portfolios and implement omni-channel strategies they are only opening new stores in the most productive locations, at the best retail centers. That means that mid-tier and lower-tier properties are at increased risk of vacancy and default, even as owners of class-A centers report better operating metrics. It also means that once a struggling center loses a tenant, it’s much more difficult to find a replacement, adds Joe McBride, a research analyst with New York City-based research provider Trepp LLC. In the first quarter of 2013, the volume of newly distressed retail mortgages rose slightly from year end 2012, to $1.2 billion, according to Real Capital Analytics (RCA), a New York City-based research firm. The good news is that the figure still represents a year-over-year decline of approximately 50 percent in new distress situations. The total volume of distressed retail mortgages totaled $26.8 billion in the first quarter. RCA reports that 62 percent of all retail distress situations reported during this market cycle have already been worked out. CMBS loans currently account for the greatest share of distress in the retail sector, at $17.0 billion in loans outstanding. Distressed loans underwritten by domestic banks fill the number two spot, at $4.7 billion, followed by loans issued by entities described as “other,” at approximately $3.7 billion. International banks had $770 million in retail loans outstanding in the first quarter, while insurance companies faced $311 million in distress situations. Both of the latter lender groups also reported the highest levels of loan workouts, at 74 percent and 67 percent respectively, and insurance companies boasted the best recovery rates, at 74 percent, according to RCA. Over the past 12 months, CMBS lenders experienced the smallest decline in total volume of distressed retail loans, at only 7 percent; the lowest workout level of any lender group, at 60 percent; and the lowest recovery rate, at 57 percent. That’s because CMBS lenders have taken greater risks than portfolio lenders in issuing new mortgages during the boom years, in both the quality of assets they were willing to underwrite and their loan terms, according to McBride. The “pretend and extend” approach many servicers exercised over the past few years hasn’t helped matters. Plus, retail properties, along with office buildings, have historically accounted for a disproportionately large share of all CMBS issuance. In 2004, for example, retail accounted for 35 percent of all CMBS originations, more than any other property type, reports J.P. Morgan Securities LLC. The loss severity for retail CMBS loans issued that year is 41 percent, according to J.P. Morgan estimates. 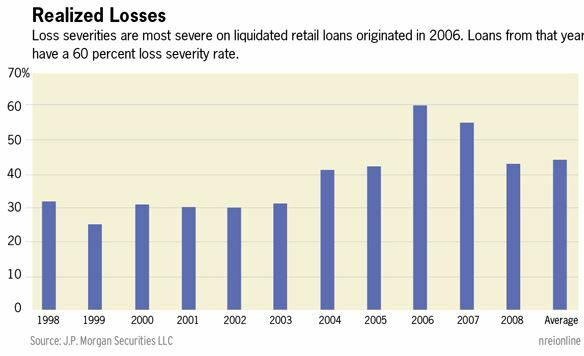 The loss severity for retail CMBS loans issued at the very peak of the market, in 2006, is a whopping 60 percent. (The average loss severity for all CMBS loans issued that year is 43 percent). Today, loans backed by retail assets account for 24.8 percent of all CMBS loans in special servicing, second only to loans backed by office buildings. In total, there are 1,054 retail loans in special servicing, with an aggregate balance of approximately $14.1 billion and average loan size of $13.4 million. Many of those loans are backed by properties in Georgia, Nevada and Southern California, J.P. Morgan reports. Those numbers might still grow. Morningstar Credit Ratings reports that it added $858 million in retail loans, secured by 137 properties, to its CMBS watch list in March. Retail represented one-third of all CMBS loans added to the watch list that month, according to Frank Innaurato, managing director with the CMBS surveillance group at the firm. At the end of the first quarter, outstanding CMBS loans secured by retail assets accounted for $49 billion in aggregate, or more than 26 percent of all loans on Morningstar’s watch list. “One of the things we are most worried about on the CMBS side, especially on regional malls with weaker anchors, is that as some of these loans approach maturities between 2014 and 2015 the ability to take out financing is going to be a challenge,” says Putro. In April, the delinquency rate on all CMBS loans backed by retail assets averaged 7.68 percent, an improvement over the peak of 8.3 percent reached in mid-2012 and also the lowest delinquency rate reported for any of the commercial property types, according to Trepp numbers. The retail delinquency also improved 23 basis points month-over-month. Loss severity for CMBS retail loans, however, is higher than for loans on other properties, at 50.26 percent, and it’s not likely to improve much in the coming months. There are plenty of investors in the market eager to buy troubled retail loans, according to Gerry Mason, executive managing director with real estate services firm Savills LLC. But they are looking to buy these loans at 20 or 30 cents on the dollar, make minimal improvements to the underlying properties and then sell them in a relatively short period of time.